Forum goers and redditors have been campaigning for the removal of Red Shell from a number of major games recently, calling the program “spyware.” Red Shell’s data collection isn’t quite the identity-thieving operation your Orwellian nightmares are made of, but its implementation and sketchy disclosures have players understandably concerned about how their information is being used – and developers have been quick to drop the program. Be sneaky – in a more productive way – with the best stealth games on PC. The information collected includes “operating system, browser version number, IP address (anonymized through one-way hashing), screen resolution, in-game user id, and font profiles.” Red Shell promises that only “device” information is collected on your computer, with nothing personally identifiable included in their tracking. Players began to take notice of Red Shell over the past few months, with its installation in Conan Exiles and The Elder Scrolls Online getting noticed early. The controversial points are pretty similar throughout – the program collects data identifying your computer without asking you to opt-in. Players are especially concerned about the practice’s legal standing following GDPR. The biggest collection of info on Red Shell came via a post to the Steam subreddit, and this inflection point has brought promises to remove the software from a wide number of developers. 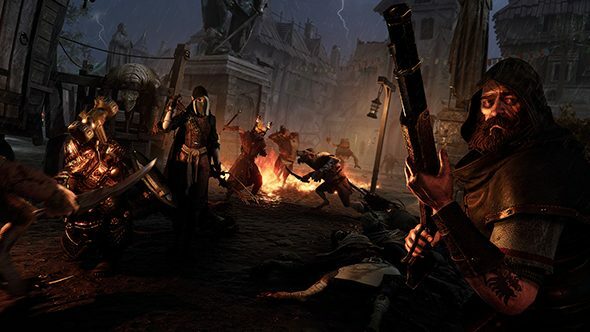 The ESO and Conan Exiles devs had already pledged to remove Red Shell, and they’ve been joined by the makers of Total War, Dead by Daylight, Vermintide, and Hunt: Showdown. But there are plenty of other titles containing Red Shell, and many of those developers have yet to comment on the controversy. The community reports that Civilization VI, Kerbal Space Program, Injustice 2, and plenty more all feature the software, with no stated plans for removal. There’s an opt-out page allowing you to back out of any tracking from Red Shell, though given its invisible implementation in many titles it’s pretty likely you didn’t know you were being tracked in the first place. With that in mind, it’s easy to understand why many are cautious about the info that’s being collected.